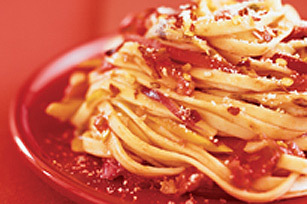 Beat the clock with a speedy and spicy twist on traditional pasta. Heat oil in large frypan on medium-high heat. Add chicken and garlic; cook 4 to 5 min. or until chicken is cooked through, stirring frequently. Add carrots, onion, bell peppers, tomatoes and crushed red pepper; stir. Bring to boil. Reduce heat to medium-low; simmer 8 to 10 min. or until vegetables are crisp-tender. Meanwhile, bring a large pot of water to boil. Add pasta and cook until tender. Stir half of the cheese into sauce; spoon over drained pasta. Top with remaining cheese. Sprinkle with additional crushed red pepper, if desired. After cutting raw chicken, wash cutting board and cutlery in warm soapy water. Never place cooked chicken on the same plate that held raw chicken. This main meal pasta is an excellent source of vitamins A and C and a good source of the minerals calcium and iron.